I live in New York City among steel and concrete mountains shrouded in smoke. They crowd me, their towering penthouse peaks stealing my light and air. Cold and soulless, they don’t beckon or welcome me. They simply hold me captive as I hibernate, dreaming of other mountains. About seven hundred miles south, those other mountains lie in wait. They, too, are shrouded in smoke, named “Shaconage” by the Cherokees, or land of the blue smoke. But these mountains don’t crowd me; they swell my spirit. They don’t steal my light and air; they create it. Teeming with soul and wisdom, the Blue Ridge Mountains of North Carolina call me—constantly—to return home. These mountains are the ancient ones. Approximately 480 million years old, their highest points, originally higher than the Rockies, are now worn down to the elevation of Denver on the flat Colorado plains. I was raised in the cradle of these old ones—on a farm burrowed in a mountain hollow along the French Broad River Valley near the stone angel statue that inspired Thomas Wolfe’s great novel, Look Homeward, Angel. Watching over me was a protective ring of bald mountains and forested peaks with names like Mt. Pisgah, Caesar’s Head, Graveyard Hill, and Black Balsam Knob. They tended me as I grew from seedling to sapling. They stood in knowing silence when I, like Thomas Wolfe, left to make my fortune in faraway lands with false mountains. And now the true mountains wait, tending to six generations of my Scotch-Irish-German ancestors, who rest in their hillsides covered with Appalachian soil and ancient, lichen-covered headstones bearing names like Whitmire, Glazener, Siniard, and Galloway. Once a year or so, I emerge from my northern city prison and come south to remember the place from whence I came, always reserving a seat on the right-hand side of the plane so I can see the blue-misted peaks appear about an hour after takeoff. Every year that I return, those peaks offer a different blessing. 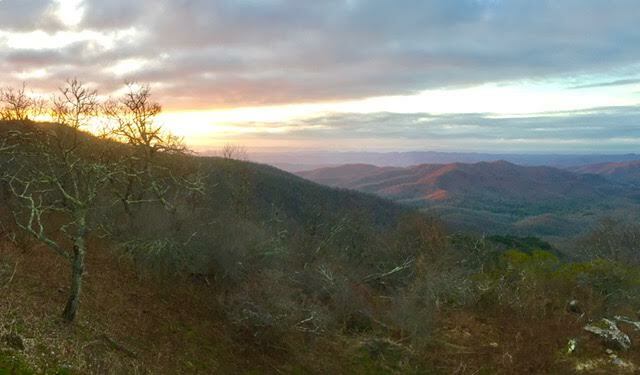 Sometimes it is a hike under an azure-colored sky along the high ridgeline of the Blue Ridge Parkway near the beautiful Pisgah Inn, or a close miss while fly fishing for a feisty brook trout in a rushing eddy of the Davidson River. But then there are times when I come, my life knotted in worry and stress, and the peaks offer me the blessing of perspective. I am reminded why I do things the way I do. The very manner in which I speak, sing, or think is a product of this history. Like an old hemlock, those roots stabilize and strengthen me. As I begin hiking the damp, mossy, rhododendron-shaded trails, life shifts. Problems seem to fade into the sprawling green valley below. Stress becomes relative when I think about what these mountains have seen in their lifetime, what they have lived through, what they have survived. The mountains remind me of the long view–that each day is only a tiny snapshot in the panorama of life. I always leave their embrace with an emotional wind at my back urging me forward. Maybe one day I’ll return here to live out my days. But if not, I’ll return in the end—sprinkled as dusty food for that brook trout I couldn’t catch, or as fertilizer for some lucky mountain laurel. It is then that I, too, will become one of the old ones, watching over my own.